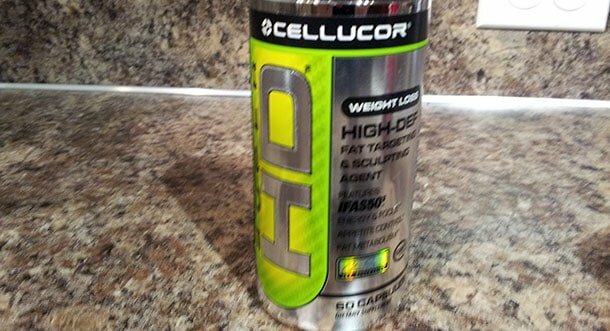 Cellucor Super HD is a weight loss supplement and thermogenic. I’ll have to say that the thermogenic part works well and it did help get some water weight off. I was taking this when I got to my lowest weight and honestly I do like this product and other Cellucor products. Price: 60 Cap bottle for $39.99. Muscle and Strength is offering a free T-shirt with the purchase of the 60 cap bottle. Other Ingredients: Capsule Shell (Gelatin And Titanium Dioxide), Microcrystalline Cellulose, Magnesium Stearate, Silica. As a dietary supplement, begin by taking one serving (1 capsule) in the morning on an empty stomach and one serving (1 capsule) 5-6 hours later in the mid-afternoon to assess tolerance. If well tolerated, an additional capsule may be added to the morning serving for a total of 3 capsules per day. DO NOT EXCEED MORNING SERVING SIZE OF ONE CAPSULE FOR THE FIRST SEVERAL DAYS OF USE AND UNTIL TOLERANCE IS ASSESSED. Do NOT Exceed 3 Capsules in a 24 hour period. Drink plenty of water throughout the day to avoid dehydration. Super HD may be taken for up to 8 weeks but should then be discontinued for a minimum of 4 weeks. Do not use if pregnant or nursing. This product is only intended for healthy adults, 18 years of age or older. Before using this product consult with your physician if you are using any prescription or over the counter medication of if you have or suspect you have any pre-existing medical condition including but not limited to: high or low blood pressure, cardiac arrhythmia, stroke, heart, liver, kidney or thyroid disease, seizure disorder, psychiatric disease, diabetes, difficulty urinating due to prostate enlargement or if you are taking a MAOI (Monoamine Oxidase Inhibitor) or any other medication. Discontinue use and consult your health care professional if you experience any adverse reaction to this product. Do not use if safety seal is broken or missing. Store in a cool dry place. Keep Out Of Reach Of Children. This stuff is pretty potent. I’m pretty stim tolerant and the thermogenics will really keep you warm. I get flushed in the face from niacin so that’s another thing you need to be conscious about if you have to be in front of people and you don’t want to have a flushed face. This stuff works, keeps you hot, gives you energy and if you follow the dosing directions you will be alright. I think a couple of times I took more than what it said and it didn’t do any harm, but it didn’t really help anymore than it was already doing. If you’re looking for a decently priced fat burner, give this one a whirl. Be sure to drink enough water, I got dehydrated headaches a lot because I didn’t know any better. I will purchase this supplement again soon.